Rating systems and reviews help warn people away from watching movies that they might find too much for their ability to cope with. I’m curious why simply providing warning up front about a game’s themes is not sufficient. The concern that I avoid “harm” for the sensibilities of people I don’t know in any way more than giving them a clue ahead of time about what they might encounter keeps me from being overly interested in gaming with strangers as a referee. My stance at the moment is to treat RPGs generally in the same way as other social activities — I generally prefer to get to know people a bit first before I invite them into my home; I have similar feelings about games I run. The challenge with relying on warnings as a general solution is that it can be sometimes hard to know what to warn about. The list of topics that people might find unpleasant is long, and I can imagine a situation reminiscent of an end user license agreement that nobody actually reads anyways. I think there are probably more creative approaches. 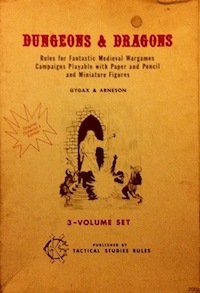 For example, D&D 5E introduces complexity gradually to help deal with creeping character build complexity so that players can avoid making all the decisions at once and learn on the job. Perhaps it makes sense to think about cranking up the degree of extremity gradually, on whatever dimension you are working, in a similar manner. Before you drop full body horror, maybe a best practice would be something like describing maggots infesting a dead monster carcass, to see how your players react. Or whatever. That’s just off the top of my head; I’m sure there are other techniques. Yeah, Brendan, you mentioned the technique I was going to suggest here, which is whenever possible to escalate potentially upsetting situations gradually and in discrete chunks of description interspersed with the opportunity for PCs to convey their reactions when possible, and to de-escalate (by de-prioritising the vividness of the language and the amount of screen time it takes up) if people seem troubled by it. You don’t need stupid things like X cards when you know (at least vaguely) in advance how certain people react. Unless you’re out to play a game with strangers, maybe running a one shot for newbies, you’d ideally not want to play with people who can’t handle anything and start having hysterical hissy fits. We’re all supposed to be adults here, well in theory anyway. We should be able to manage ourselves and our groups like reasonable human beings. Anyone who is so fragile as to not even be able to handle completely mundane matters has no place at my table because it is a waste of everyone’s time if they’re going to participate in something that will make them upset. But seriously, unless you drop a massive, gore-filled bombshell of pure unadulterated horror you should be able to gauge someone’s mental stability and how easily upset they are way before starting a game. If there’s one thing that is true these days is that everyone who is easily upset by something will broadcast to everyone how badly they hate X. If someone says “Oh I don’t watch horror movies they scare me” I’m not going to rope them into a game of Dark Heresy, Call of Cthulhu or anything of that level. If they say it’s okay even when I warned them and they get all horrified and freak out like children that’s their fault. Seriously it’s not that hard to gauge people. There’s no need to implement X cards unless your group is nothing but neurotic people who aren’t even functional human being. At that point maybe playing an RPG isn’t a good idea…. Seriously, humans have the ability to talk to each others for a reason. As you can probably tell from my post, I think it is a mistake to consider the x-card a panacea, or even a particularly good solution in many cases. However, the topic here is to consider alternative approaches to the problem of managing potential conflict between players. I think further direct criticism of the x-card will probably be boring, so let’s avoid that please. Well maybe so but I doubt there is such thing as a universal solution. This is all part of having to tailor your game and playstyle into something that suit both the GM and other players.